So you've seen how to accurately pick a single colour from a choice of nearly seventeen million, and you're feeling pretty confident about it all. The final part in this series covers a few of the quirks of individual applications that might just trip you up. If you work with Excel 2007 or 2010 you'll be pleased to know that each workbook allows you to use the full RGB colour palette. If you work in an earlier version of Excel however, each workbook limits you to using only 56 of the available colours at any one time. The standard 56-colour palette in Excel 2003. On the dialog box, click the Color tab. Select the colour you want to replace and then click the Modify... button. Here we're changing one of the horrible, murky green colours into something more... "palette-able". 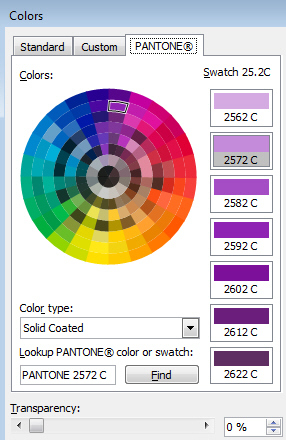 In the Colors dialog box, select the colour you want to use and then click OK. This dialog box should be looking quite familiar by now. Continue replacing the colours you don't need with ones that you do, and finally click OK. Whenever you click one of the colour picker tools you should see your selected colours have replaced the original ones. 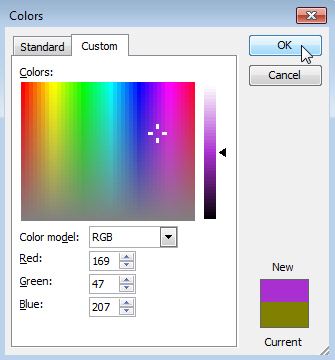 Your custom colours will replace the originals in any of the colour picker drop down lists. Your custom colours are saved along with the file you modified the colours in, so if you create a new workbook you'll find that Excel reverts to using the original colour palette. 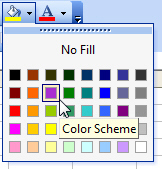 If you thought that only being able to choose 56 colours in Excel was limiting, if you happen to use a version of Microsoft Project prior to Project 2010 you'll be used to only having access to 16 colours. To make things worse, the default colours are horrible and you don't even have the option to change them! It's almost worth buying Project 2010 just for the ability to use the full range of colours. Seriously, who thought this was an attractive colour set? As already mentioned in this blog, Microsoft's desktop publishing software, Microsoft Publisher, has a couple of extra colour models available to help you if you're having your documents printed professionally. You can see these extra models from the standard Colors dialog box. 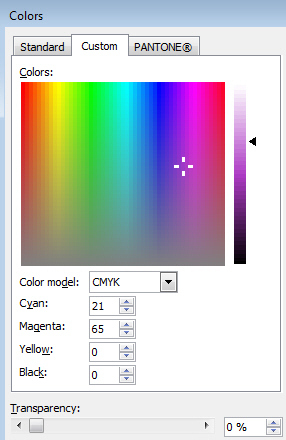 The CMYK model is available on the same tab of the dialog box as the RGB and HSL models. The PANTONE colour model has it's own dedicated tab in Publisher 2007 and 2010. And that's pretty much all there is to know about how to choose colours in Microsoft Office applications.